From High In The Sky: Towards the New Year..
..and goodbye to that time after Christmas I look forward to so much every year. Everyone together, plenty of food to go round and more than enough of everything we could possibly need to entertain ourselves without having to look too far. We've had a lovely time of it here. We found out how many people it takes to buy two goldfish for one new (Nemo, not SpongeBob) fish tank; and that would be two uncles, two cousins, one aunt, one long suffering mother and one highly excited small boy. Gotta love a pet shop at three o'clock on Christmas Eve afternoon. We ate our traditional Fair fare of ham on Christmas Eve night, then turkey followed by Grannie Fair's special recipe Christmas pudding on the Big day itself, with mince pies and gingerbread for snacking on. We turned off the computer and made our own fun - build a cardboard hamster castle, anyone? - and we put on our new Christmas clothes and decided we didn't need to go to the sales after all (not when we've got Little E printed our socks. No outfit needs anything more to be perfect!). We ventured out for a walk and discovered we were so out of condition we're going striding (ha) out again today..before life all returns to normal, before we start the New Year. "I can't read" Little E said to me on Christmas Eve. Not with regret - that's not his style - but with a happy sense of achievement at the things he can do and a cheerful anticipation of learning something new. That's a pretty good place to be, heading towards January. I'm going to try to follow his lead. I don't really do resolutions, but I do like to look out for something new to have a go at during the year. Mmm..more quilting, maybe? If I try it, you'll hear about it. You can count on that. Your company has meant a lot to me this year: thank you so much for reading and saying hello and sticking around. Very best wishes from me to you for a wonderful 2014. Have a good one! Wishing you all a Lovely 2014. Sounds like a fabulous Christmas week! Hope 2014 is great, too! Sounds like you had a wonderful time. Just love Little E's take on things. Happy New Year to the Fair family. Sounds like you had all the right ingredients for a lovely Christmas; I look forward to hearing not only the adventures of Little E but the fish as well in the new year. Little E socks? They sound like winners to me. Thank you so much for hosting some fab projects this year and I'm really hoping you have something organised for us in 2014. Knitting your own moustaches book eh? That sounds fan'tash'tic! Happy New Year! Happy New Year, my friend! Can't wait to see what 2014 has in store for us. A very happy 2014 to you and yours! See you on the other side. Happy New Year....look forward to seeing whatever you're up to in 2014. Good luck with the (non)resolutions. Oh do share pictures of Little E's socks! Sian, Happy New Year to you as well. I'm looking to all the good things you will present to us in 2014. Sounds like a wonderful way to finish out the year. Happy New Year and best wishes for 2014! Home made fun is always the best! Wishing you all a Very Happy New Year :). Happiest of New Years to you and yours! I'm looking forward to another year of inspiration here. Happy New Year Sian!! Looking forward to another year of blogging & scrapping & crafting & storytelling together in blogland! It does sound like a joyful holiday you've had. I hope you hit your stride in 2014, (we could all do with more of that) and that you continue to share Little E's wisdom with us. Happy New Year! I'm holding on to the post-Christmas glow until Sunday! I so love this slow time of year. Sounds like you had a lovely Christmas, Sian, and I'm so glad about that. It's so much fun to have a little one around to put a fresh spin on things, isn't it? 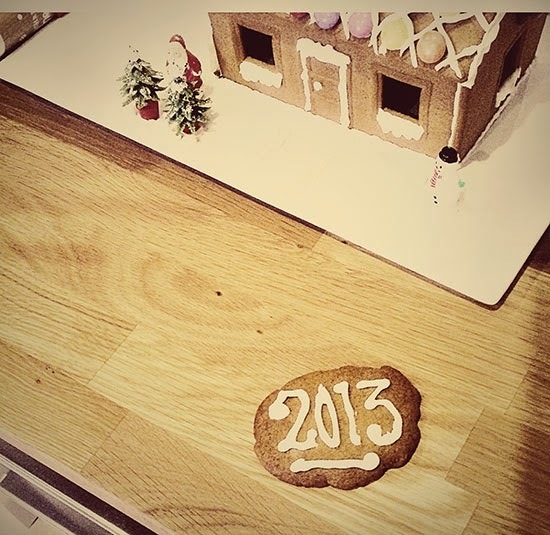 All the best to you in this new year, my sweet blog friend! Sounds like the best Chrissie! Love the gingerbread house! Happy 2014!! !